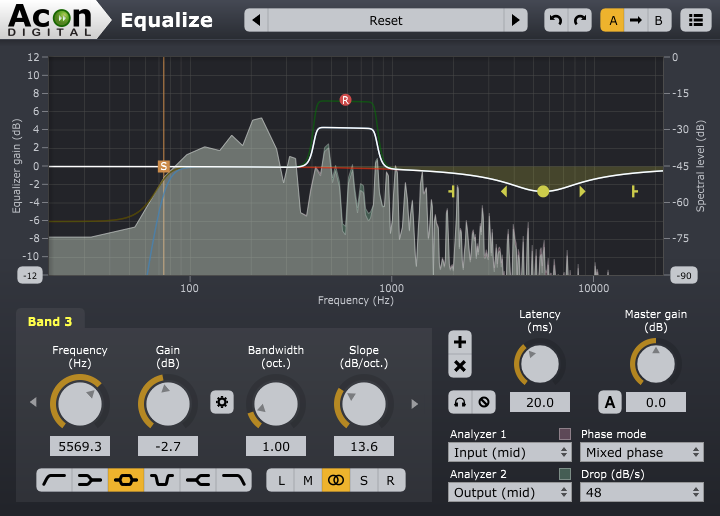 Oslo, November 11th, 2014 – Acon Digital has released Equalize, a parametric equalizer plug-in that combines unique features with excellent workflow and an intuitive user interface. Unlike existing equalizers, not only the frequency, gain and bandwidth, but also the filter slope can be adjusted freely for each frequency band. The filter slope can be set anywhere from 3 to ultra-sharp 120 dB per octave. Equalize operates as a zero latency plug-in when using the minimum phase mode or can preserve phase relationships in the linear phase mode. A novelty is the additional mixed phase mode that allows latency adjustments in the range 5 to 120 milliseconds while preserving the phase relationships as far as possible. That gives a unique control over potential pre-ringing which is a common problem with linear phase filtering. Latency values around 20 milliseconds ensure inaudible pre-ringing artifacts due to the temporal masking of the human hearing while preserving the time-alignment across the audible frequency range.